We sell a wide selection of portable exhibit displays that are designed to meet your trade show, convention, and presentation needs. 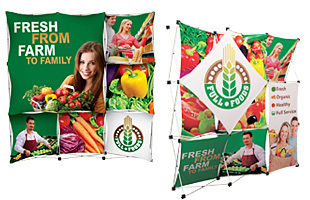 Portable exhibits, such as portable graphic displays, hook & loop display booths, and tabletop display boards, offer a great way to sell your products and services at promotional events. 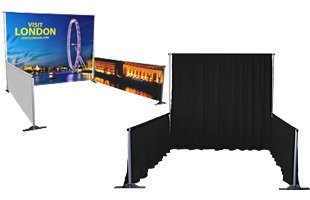 Our complete line of portable exhibit displays includes everything you need to make your next event a success. 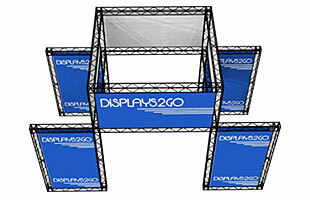 Portable exhibits can make all the difference in the experience that a company has at a tradeshow, convention or expo. With the ease of these portable exhibit displays, you can be into the exhibition hall and have your display set up in no time! 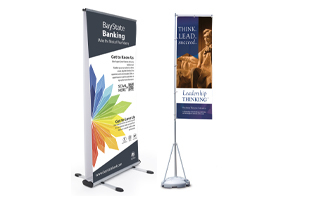 These portable exhibits offer lightweight, easy to setup, flexible designs that will help you present your products and services with professionalism and style. Tradeshows and other promotional events can be a crucial part of making your business a success; they give your company invaluable exposure and allow you to reach hundreds of people at one time. These portable exhibits help you to put your best foot forward and show your customers what you are selling and why they should invest in you. 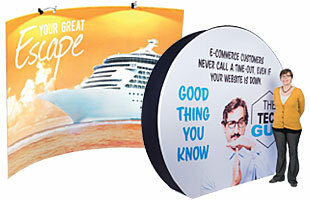 Our line of portable exhibit displays includes everything you need for a successful exhibit. We sell everything from pop up displays and hook & loop-receptive booths, to hanging banners, literature holders, and accessories. 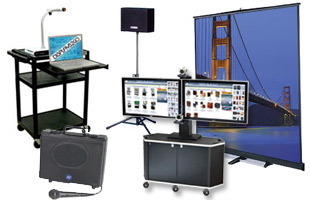 We sell portable exhibits with every need and budget in mind. 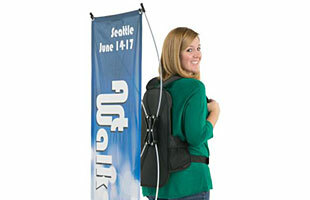 A great way to get a customized exhibit booth at a low cost is with our line of inexpensive tradeshow exhibit displays. These exhibit booths have 10 panels that allow for quick assembly and are covered in hook and loop receptive material. 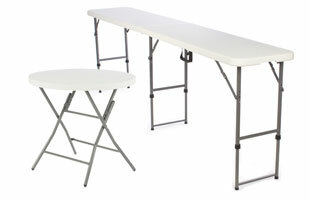 The lightweight panels fold and snap together which allows you to move from one location to another with ease. 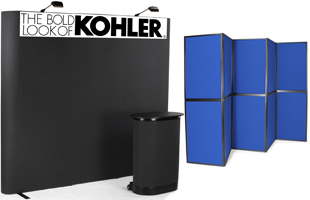 These portable booths are ideal for companies that need to get in and out of a tradeshow quickly. All of these boards are made with hook & loop-receptive fabric so you are able to attach any accessory such as posters, sell sheets and acrylic accessories to your display. 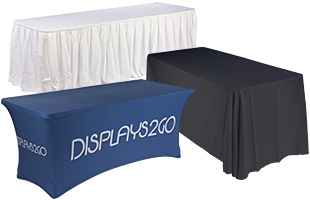 We also sell more upscale adjustable trade show displays that are covered in hook and loop receptive material. 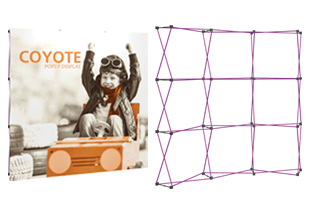 These exhibit booths feature a pop up frame and come in a variety of styles, sizes and colors. Both of these options allow you to customize your display to your particular needs, and come with the option of a customized header. 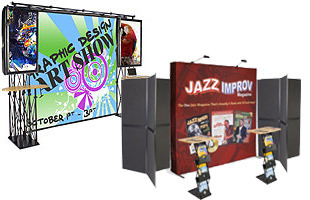 In addition to display booths covered in hook & pile-receptive fabric, we also sell portable exhibits with pop up frames and huge, custom color graphics. Both our lightweight graphic pop up displays and our high resolution graphic portable exhibits make excellent backdrops in trade show and convention booths. 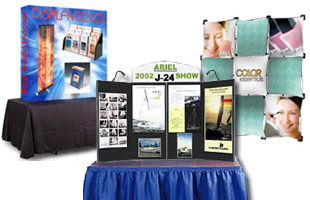 Exhibit booths are not all you need to make a trade show or convention display successful. 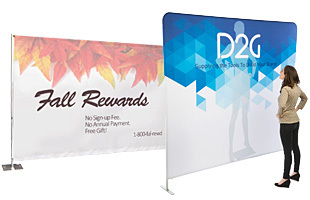 As a part of our line of portable exhibits, we also sell banner stands, literature holders, portable flooring, table covers, and more, all of which are designed to enhance your trade show displays. 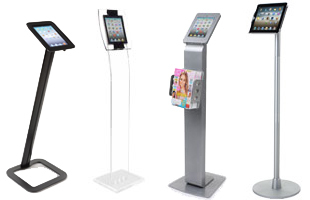 Portable banner stands offer a great way to add eye-catching graphics at the entrance of your booth, while iPad display stands get your information out to potential customers and clients. Portable counters offer a convenient place to display literature and demonstrate products, while portable flooring can ease the feet of tired show-goers. 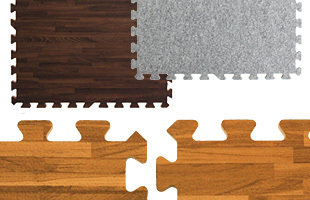 Booth accessories can also help separate you from the competition with fit and finish. Spotlights and banner lighting also help make your message jump out. Trade show accessories, such as chairs, carrying cases, and prize wheels, can also offer your trade show booths the special finishing touches that will separate you from your competition. 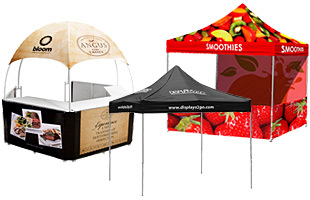 Portable exhibits, such as pop up booths, banner stands, and more, offer a great way to advertise your business at trade shows and other promotional events. 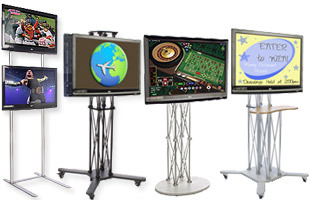 We sell all of the portable exhibits that you need to make your next event a success one. 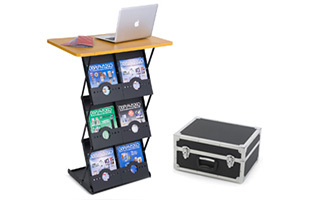 In addition to portable tradeshow displays, Displays2go is one stop shopping for all of your point of purchase needs including ballot boxes, sign holders, lecterns, stanchions and literature stands. Thousands of products are in stock and ready to ship to you. 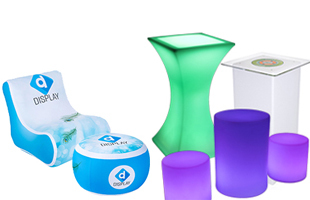 We have been manufacturing and shipping pop products for over 40 years and our product line continues to grow daily. Orders can be easily placed from our website or over the phone. Our staff is waiting for your order. In addition, our design sales team can quote and prototype your custom sample requests in hours not days. Start by browsing our main shopping categories today.